Two Months Back in the US How I’m different: 1. I’m a clean person now. I wash my dishes every night, I make my bed every morning, I use disinfectant wipes on every surface I can reach, I put clothes away. Something about being unsure of my living situation for 10 weeks made me appreciate the stability of my apartment in Ann Arbor. And no matter where I lived in that time, I had a maid. I’d grown to enjoy living in a space that’s clean and organized, and I knew that I could keep my apartment that clean when I was back in the US. 2. I cook now. A lot. After eating takeout nearly every night in Bombay for $3-$4 a meal, I refused to order $10 No Thai or a $7 Chipotle burrito just because I was too lazy to cook. I don’t eat out unless I absolutely have to, and I don’t buy a lot of processed foods. And after realizing in Bombay that my body does NOT like paneer, I don’t eat much dairy anymore either. I’m a clean eating, meal prepping, vegan. Weird, huh? 3. I don’t have nearly as many possessions. Living out of a suitcase for nearly 6 months, including my time in London, made me realize just how many things I own that I just don’t need- clothes, books, random kitchen items. I owned things that I didn’t even think about during those 6 months, and if I could go that long without needing them, why did I still have them? 4. I write in my journal every day. I learned the importance of writing as a means of escape and remembering, and there’s nothing that calms my mind more. I rarely read what I’d written months before- journaling for me is about processing feelings and thoughts for the day, and leaving them on the page. 5. I try to read New York Times articles about Indian politics and social climate every day. I check up on Buzzfeed India every day. 6. I’ll walk down the street and smell something that instantly brings me back to Bombay. The smell of incense burning on sugar cane juice stands, of a vendor heating up a veg puff or a chicken lollipop, of a seaside joggin park right after a short downpour. I never know what in the US triggers this memory, but every time it happens, I’m shocked at just how powerful the sensation is. 7. I get angry when I hear people making blanket statements about India without acknowledging the complexity of the issues they’re talking about. When I hear India being described as a “third world country.” 8. I can’t wait to go back again. Whether I’m just visiting or starting a new project or working with the same NGO, I know that I will be back in Bombay one day. I know that I want to work outside of the US as much as possible, and that though most people in my field bolt to New York City when they graduate, New York City will always be there. I can pursue what I want to pursue right now. I’m grateful to Janelle, the staff at the Center of South Asian Studies, and the mighty anonymous donor for the most meaningful, formative experience in my 21 years. This entry was posted in Uncategorized by Jo Ellen Pellman. Bookmark the permalink. Jo Ellen is a junior from Cincinnati, Ohio majoring in Musical Theatre and minoring in Creative Writing. 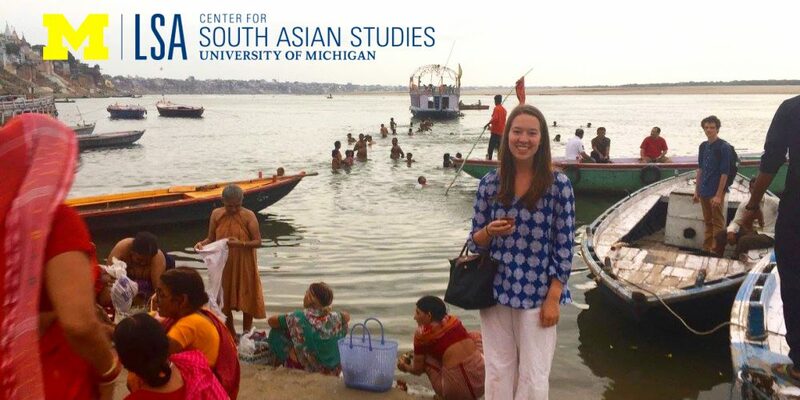 Jo Ellen will be spending two months in Mumbai volunteering for Khula Aasman, a non-profit organization dedicated to blending expressive arts therapies with social change. With the Khula Aasman team, she will be facilitating creative theatre workshops with various communities across Mumbai, including women in incarceration and women in trafficking. Art is a great healer- it offers the opportunity to transcend the boundaries of class, religion, caste and gender. Jo Ellen’s final project will focus on the immediate emotional effects of the workshops on the participants and what forms of art therapy resonated with them the most. Her research will provide Khula Aasman with a correlation between the most effective arts therapy methods for the demographics that they serve in order to tailor workshops to best meet the needs of the Mumbai community.